Like last year, I do my own New Years resolution for my hobby work, wether it’s getting an army done on a deadline, or focusing on being more involved with communication with the community. Discovering new styles and mediums in art projects, developing new designs that’s not in my comfort zone. (Thankfully I’ve learnt something new and pushed myself to do weird and interesting stuff. My Lord Tennyson canvas painting was a step in the right direction for my artist journey, moving away from manga art as my Chosen art focus. Now that my 2017 Resolutions have been updated, I can now finally move on to 2018 list. This year, I’ve decided to make a list that will push me a bit further than last year. At least build a Death Guard army towards 1,000pt using the Patrol Detachment. Complete my Harbinger Legions (Chaos Space Marine Faction) as a corrupted Demi-company army. Including a kit of Warp Talons and painting two units of Chaos Space marines. Complete my Stormcast Eternals army by painting all four remains Hero models. Also, finish painting all remains Khorne Bloodbound models. 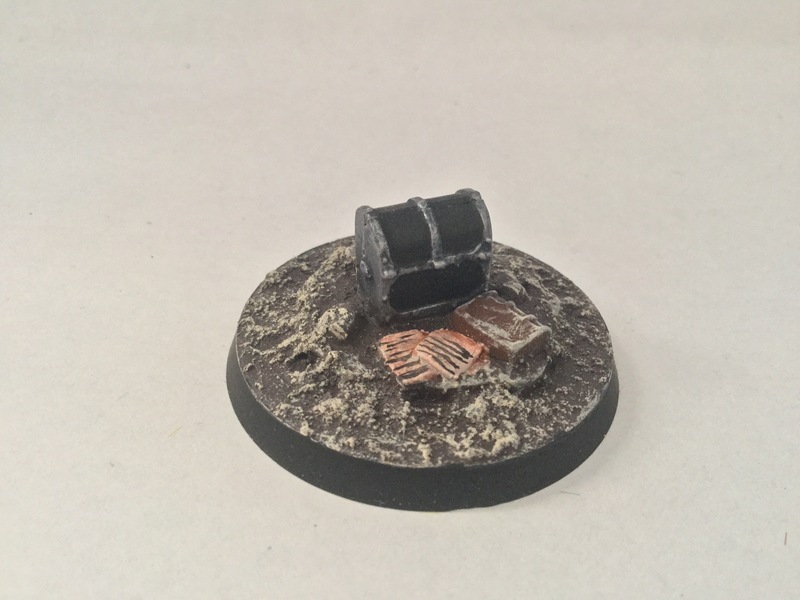 Join community challenges (primarily painting challenges), as well as communicating with the community and bloggers. Focus on painting more backlog models to paint for more storage space. Incorporate more hobby discussion posts on AoS and 40k. With that, I would like to end this post by saying thank you for reading, commenting and liking my blog posts in 2017. Welcome to The Grey-mane Dynasty lore series, a fan made collection of stories in the setting of Warhammer Age of Sigmar. The individual and multipart stories have links to the rise and fall of a once proud and united dynasty, and how it affects those who have survived in the aftermath. Each story tells a tale of locations, characters and events that tell of the events from the Age of Myth, to the fall during the Age of Chaos and hope anew in the Age of Sigmar. More stories and fan made lore will be coming soon, which will be added to the link list above. I plan to repost this post when I’ve done a new lore post, so new readers won’t be confused. I hope to continue this series to the point where I have enough story narrative/ lore content to help me start an AoS campaign, or additional fan made material for AoS games. With your feedback and help, I can be confident and guided on the right path to achieve this goal. I hope you have enjoyed this post, if you have questions, advice or anything that comes to mind, post a comment below and I’ll reply back as soon as I can. Thank you! [note: this is completely fan made lore series and is in no way affiliated with Games Workshop. All names, locations and other material related Games Workshop are owned by their respective creators]. 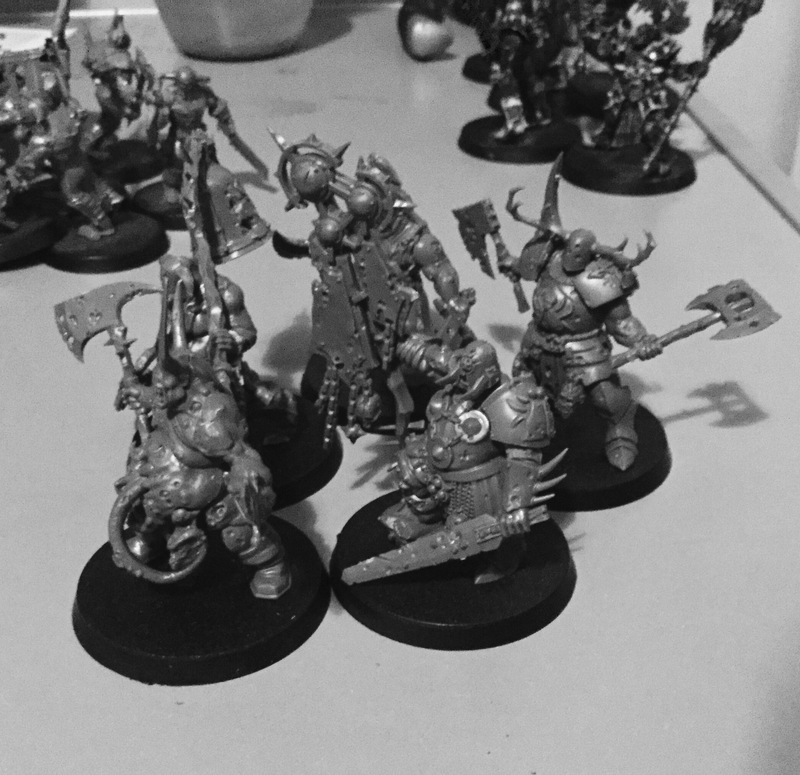 This week I played my first game of AoS Skirmish using my Khorne Bloodbound faction, and I’ve got to say, it was really *fun! I’m really engaged to do more games with Skirmish, as I can see a lot of potential to create more focused narrative stories. After the first match of Skirmish, I had a discussion with my opponent on our thoughts on the game, and wether it was worth playing into for future gaming. My thoughts on the match were fairly positive, I liked the simplicity of having smaller games that are more at stake with challenges for our factions. It opens up more deeper narrative stories that can be explored upon, for example, disrupting trade logistic supply’s, protecting your factions leader whilst traversing dangerous roads, ambushing the enemies camp in the night or even an assassination plot to gain more reputation and power. However, I do feel that there are areas in the Skirmish book that aren’t up to scratch, including some questionable choices for faction organisation. For example, for Nurgle Rotbringers, you can have one Gutrot Spume, one Lord of Plagues and up to five Blightkings. My criticism for this list is explained in bullet points below. Gutrot Spume is a unique Hero character, as mentioned in the 2016 GHB. So how come he’s the only unique Hero model from the entire grand alliance for Skirmish? Is he now a leader model that’s not unique? For Nurgle Rotbringers, we have no Sorcerer on the list, even though we have a Rotbringers Sorrcerer. Any particular reason why this character wasn’t included, as well as the Harbinger of Decay? Considering if your sticking to Nurgle Rotbringers as your only faction choice (not including other Nurgle mortal and Daemon factions), wouldn’t it be an option to have ten Blightkings? having them and a Lord of Plagues would total to 90 Renown for a 100pt game would make sense. Whilst many would disagree that the unit in question will be quite powerful, as well as the re-roll difference chart being in the Nurgle players favour (which is a valid criticism). However, the opponent will be better off with their 100pt list against the standard 55pt Nurgle Rotbringers list, and never underestimate your opponent. I think I’ll let you guys debate on this with your own opinions. But this is only part of the issue, as one of my gaming opponents had pointed out that Skirmish might have been a rushed book due to the success of Shadow of war: Armegeddon. Now it’s debatable on wether this is true or not, but I can see how the point being raised may be closer to the truth, when you can see the limitation on what factions can use for their warbands. Factions like the Death alligence have hardly anything sustainable to use apart from the Flesh-Eaters Court. Factions like the Soulblight and Deathmages are lacking variety of options for warband creation. For the Greenskin faction, they don’t even have a Warlord or Hero character to use to lead their faction! Wether the points I’ve raised here are agreeable or disagreeable, I hope they will help to improve AoS Skirmish to become a great expansion supplement, like Path to Glory. Earlier this week, I’ve found a community site called tga community (The Grand Alliance Community), which has a thread on the unofficial AoS Skirmish points for more choices including FW models. I’d recommend checking out the unofficial expanded faction lists, press/click tga community if your interested to try the lists out. When deciding on what factions I’ll be using for Skirmish, I did some checklist work on what I can and can’t use for Skirmish (consulting the AoS Skirmish book). Luckily, most of the factions I’ve collected have a variety of options to build on, so I can now plan my army lists for future project works. Each faction has it’s list combined with the amount of renown cost, that are within the rules guideline. Here are a couple of lists I’ve done so far. Those of you who have been following my blog for some time now will know that I rant a lot about my Dark Elves from time to time. Part of me wants to rebuild this faction back to its glory days when I used to play them, however, the other half of me isn’t motivated to work on them after the old world was destroyed during the End Times. Skirmish might just re-ignite my motivation to get this army onto the AoS world. I’ve based the faction on a group of Dark Aelves who follow the ‘lost god’, who has influenced these Aelves to he/she’s bidding. Originally intended as a 1,000/ 2,000pt army for my Death Alligence, the Liverbone Court is now built just for Skirmish and Path to Glory games. The faction is built more on the fluff rather than gaming, a decision that I’ve not regretted. 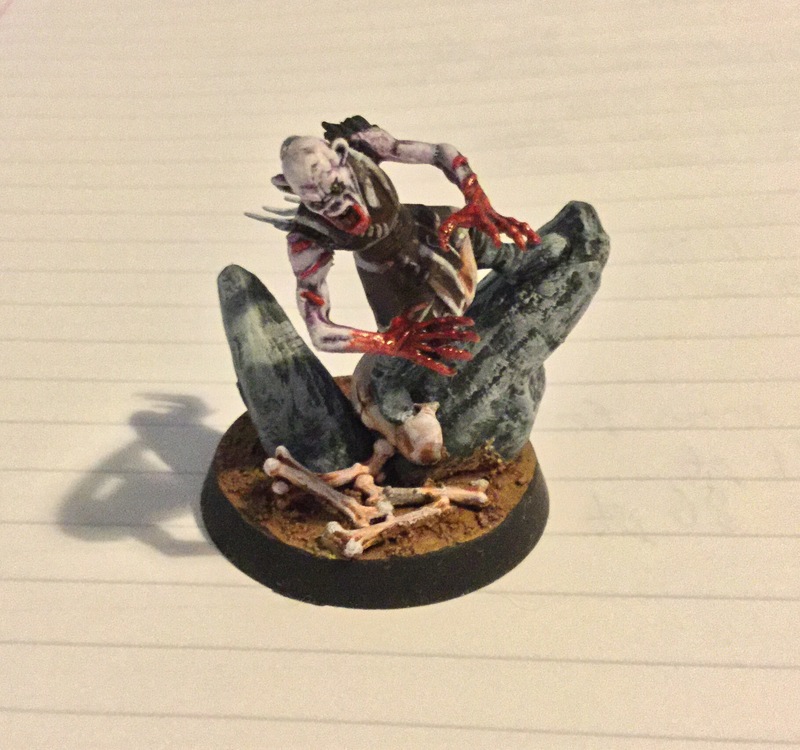 Near to completion, I’ll only need to paint 15 Crypt Ghouls, which will give me enough minions to buff with my Abhorrent Ghoul Kings magic and artefacts. My Nurgle warband is a mixture of mortals, some being disgustingly repulsive, whilst others being beyond mortal comprehension on hygiene. The Stagrot Privateers are part of the naval force that seeks to find treasure for wealth and reputation. So far, the faction is nearly completed, having purchased a unit of Blightkings to go along with the force. Sadly, I can’t include a Rotbringers Sorcerer because they’re not included in the warband list (which is quite odd). I’m really looking forward to playing this warband when I play my next game of Skirmish, especially now that I have a couple of tricks up my sleaves ;). 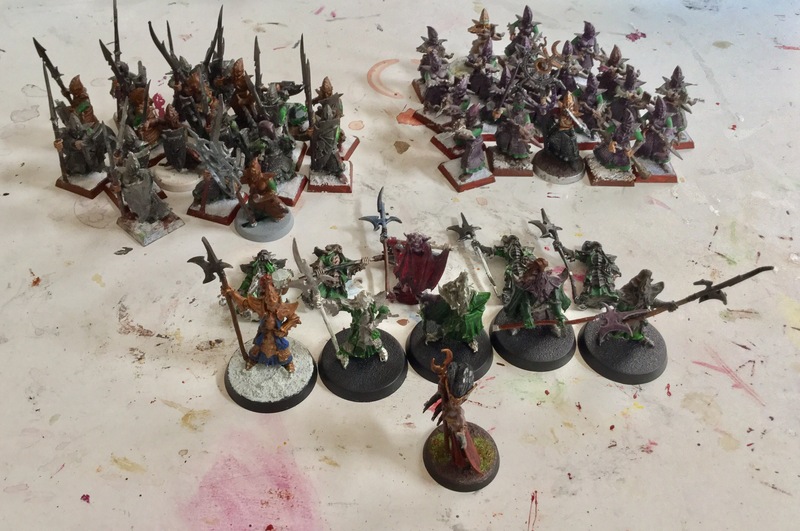 That’s all I’ve got for now for army lists for my AoS Skirmish factions. There’s a lot more to show, including Daemons of Nurgle, Stormcast Eternals, Khorne Bloodbound and much more. Sadly, I’m pressed for time as I needed to get this post done for today. But fear not, I’ll be posting more lists with narrative backgrounds next weekend. 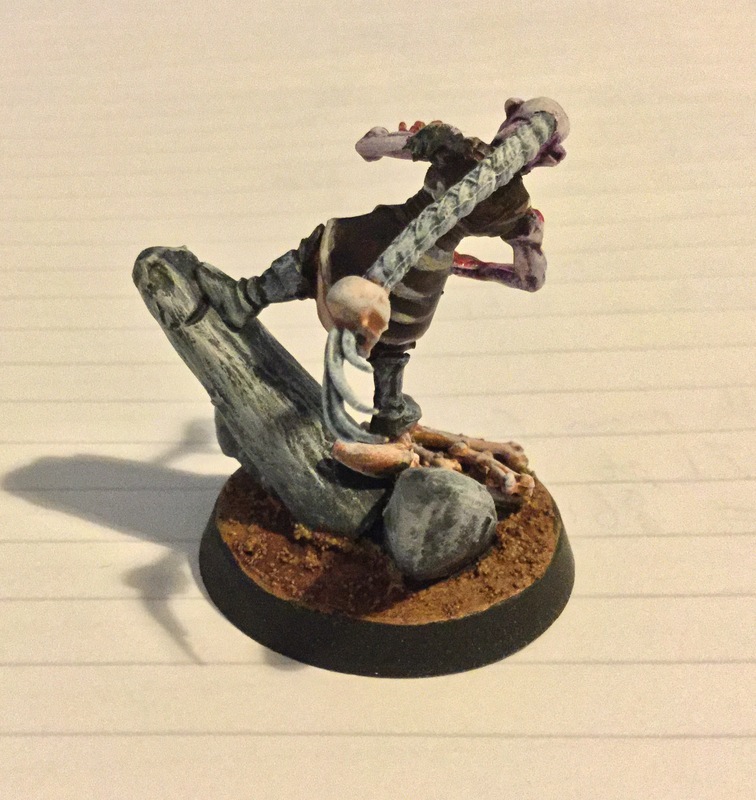 Wow, it’s been a long time since I’ve last posted an update for this faction, the last post about this army was my kit bash model of Elder Hag Hexter, which was way back in January. However, I’ve now returned to this WIP faction project after a long absence from other projects. 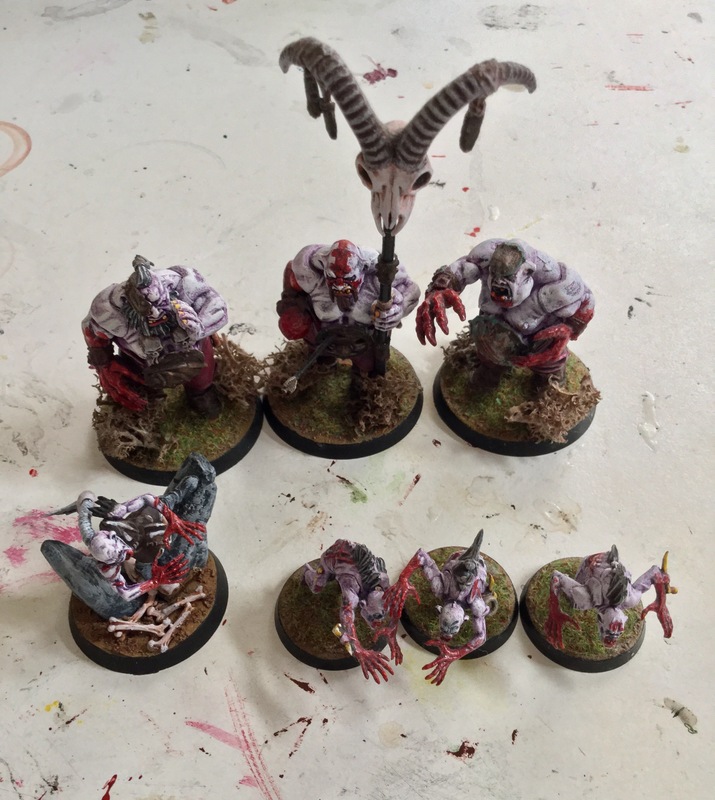 My plans for this faction have changed from my original goal of creating a 1,500pt army, to instead going towards a 100 renown Flesh-Eater Courts Skirmish hunting party. I think this is sensible decision because the army has deep lore that ties it to the Grey-mane dynasty, which would be better presented for small narrative skirmish games. Therefore I won’t need to invest much for this collection, as I’ll only need one warscroll for each unit to play skirmish. Now with that I’ve explained all that, let’s take a look and see what’s new for the faction. Elder Hag Hexter looking very grotesque and vile by the curse of King Ren’s gift, Hexter has been transformed into a creature of misery and morbidity. A Sychophant Ghoul Queen tied to the Liverbone Court, changed after nearly dying from intense magical burns by a ‘dead kings’ ring of ancestors old. Her hatred for her nemesis is raw to the core of her being, she would see that this undead king will perish by her alchemical magic, to encase him in enteral molten gold as punishment for her pain. This is one of my favourite models I’ve painted so far for this faction, I like how her pose and facial expression gives off this animalistic intent to strike at her target. The Blood on her clawed hands and mouth creates a great touch to her ghoulish state, making her less human by her degrading appearance. So far the collection includes 3x Crypt Horrors, 1x Crypt Haunter Coutier, 1x Crypt Ghast Courtier, 3x Crypt Ghouls and 1x Abhorrent Ghoul Queen. I’ve estimated that all of this totals to 80-90 renown, but I’ll check the proper calculation when I’ve got a few more Crypt Ghouls into the skirmish hunting party. 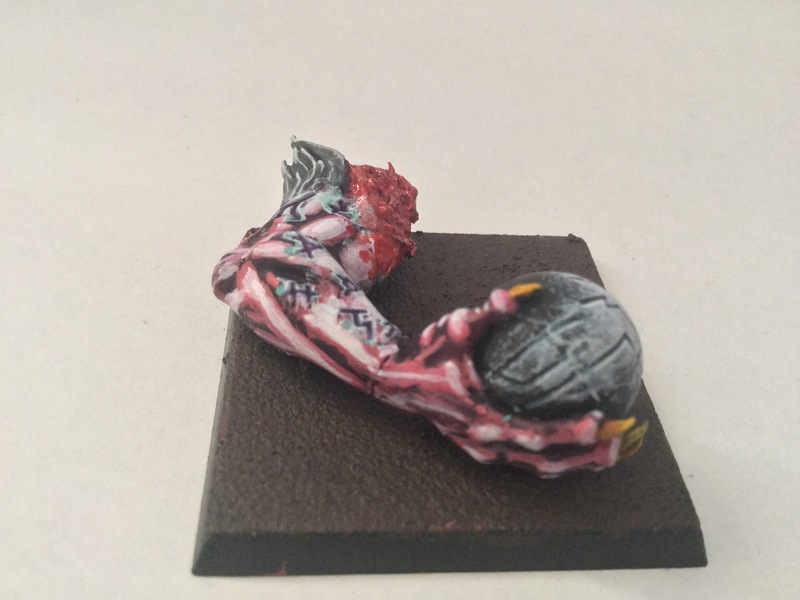 My plans for this project are to paint a few more Crypt Ghouls for a unit of 10x, as well as painting my Crypt Infernal Courtier. 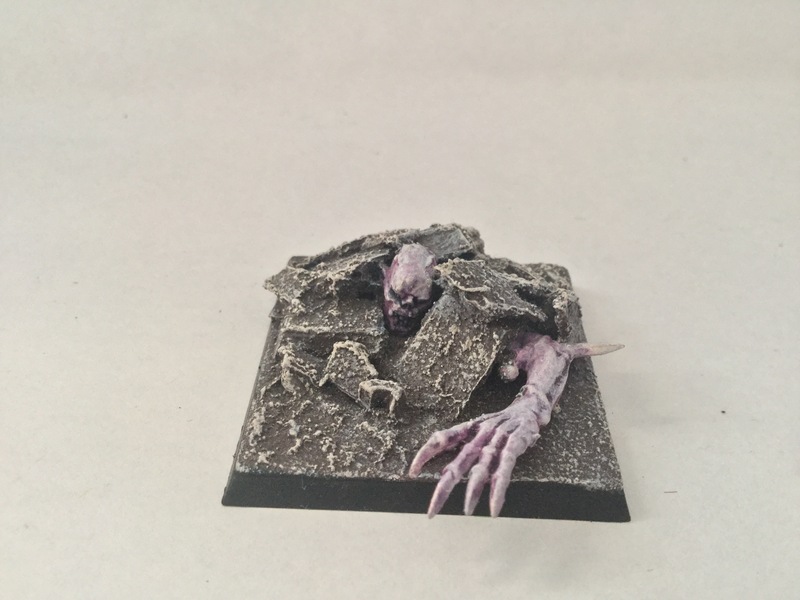 After that I’ll only need to get a unit of Crypt Flayers to finish off this project, which will give me a variety of options to choose my units for skirmish games. Thank you for reading this post. If you have any questions, post a comment below and I’ll reply back as soon as I can. Thank you!